A view of the Grozny City business centre from Akhmat Kadyrov Mosque (Heart of Chechnya). Several thousands of people gathered in Grozny’s central square on Sunday to protest against the terrorist organization Islamic State, the press service of the city mayor’s office told TASS. 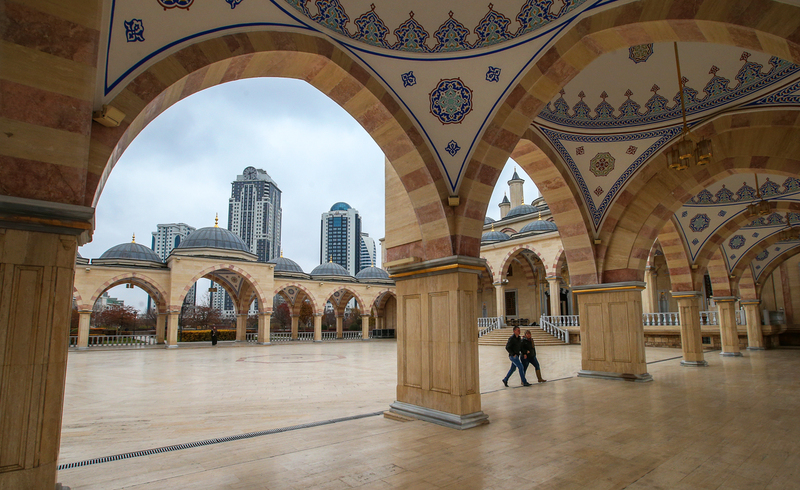 The rally was held in a square in front of the Heart of Chechnya mosque in central Grozny. "It was initiated by parents whose children have been recruited by Islamic State radicals. Activists voiced indignation at the activities of the terrorist organization and its leader Abu Bakr al-Baghdadi. Protesters called on the Chechen youth not to yield to the extremist propaganda and heed their near and dear," the press service said. The Islamic State group was set up in October 2006 after the merger of several radical groups. Now it controls a major part of Iraq and Syria. Since 2014, the U.S.-led international coalition has been delivering airstrikes on Islamic State targets. Russia has been conducting an anti-Islamic State operation since 2015.